With just a week before Amazon press announcement of, currently, unknown reason (though it is presumed to be about the Kindle), Amazon has just announced that the Kindle Fire is in the out-of-stock list, just like its counterpart Kindle Touch. But it is just the beginning. 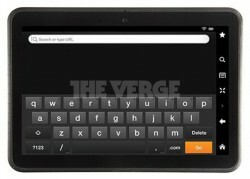 Recently, The Verge is saying that they have the image of Amazon’s new Kindle Fire. Additionally, the outlet has received another image of the device, though the mysterious sender requested not to publish the image, though it is reported that the image “shows a streamlined user interface with less ‘chrome. '” Other information include that a likely 7 and 10 inch model will be available after the announcement, although The Verge is unclear which model is shown in the image. Based on the leaked image, it reveals a front-facing camera, and a, rather clustered, navigation bar. The known Amazon keyboard is still present in the image. Some of the strange details from the image includes the fact that it has an aspect ratio of about 4:3, not a 16:9 widescreen that is known on the current model Kindle Fire. With Amazon holding a press conference on September 6, and that the current model Kindle (both the Touch and Fire models) devices are sold out for the time being, it is fairly certain that the company is planned to announce new Kindle devices. Although the image looks something that is out of the ordinary and, most likely, photoshopped, The Verge has a good track record on things like these.